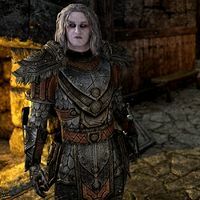 Majorn the Ancient is a Nord vampire and the patriarch of Wittestadr. His son, Valeric, blames him for the vast amounts of bloodfiends roaming the area, although Majorn believes that his son's philosophy of depending on animal blood is far more dangerous. If you side with Valeric, you will have to fight Majorn in the Wittestadr crypts. He will transform into a gargoyle during combat.